The issue has for decades caused tensions between the Holy See and Beijing. VATICAN CITY — The Vatican on Saturday announced it had signed a "provisional agreement" with China aimed at defusing tensions over the appointment of bishops, a breakthrough on an issue that stymied diplomatic relations for decades. Beijing's long-held insistence that it must approve the appointments in China clashed with absolute papal authority to pick bishops. On Saturday, the Vatican said in a statement that Pope Francis had decided to approve seven bishops named by Beijing, not the Vatican, over the years, "with the view of sustaining the proclamation of the Gospel in China." "Pope Francis hopes that, with these decisions, a new process may begin that will allow the wounds of the past to be overcome, leading to the full communion of all Chinese Catholics," the statement said. 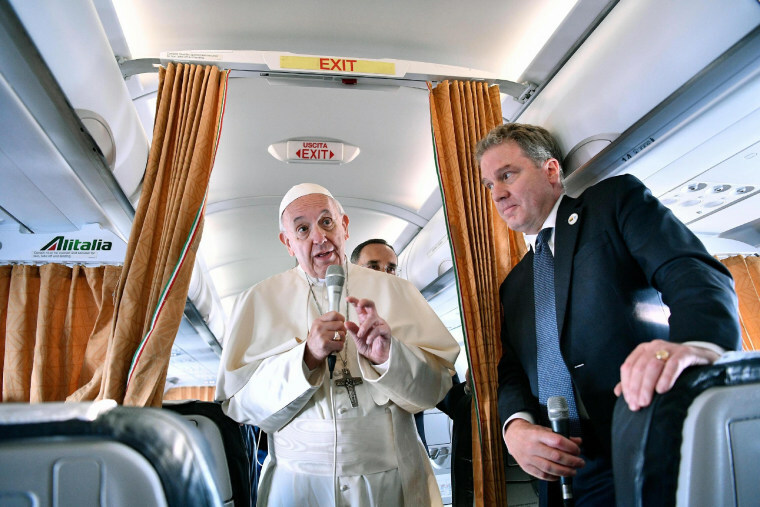 Vatican spokesman Greg Burke, speaking in Lithuania where Pope Francis was visiting, indicated the accord would provide a blueprint for future appointments of bishops, who lead the faithful in their dioceses. Burke told reporters that the aim of the accord "is not political but pastoral, allowing the faithful to have bishops who are in communion with Rome but at the same time recognized by Chinese authorities." He did not immediately provide details about the deal, announced at the Vatican and in Beijing shortly after Francis began a four-day pilgrimage to the Baltics. Taiwanese Foreign Minister Jaushieh Joseph Wu also released a statement Saturday, saying "The government of the Republic of China (Taiwan) hopes that this accord will enhance religious freedom in China and allow the Chinese Catholic Church to become an integral part of the universal Church." The Vatican described the provisional agreement as "the fruit of a gradual and reciprocal rapprochement" following a "long process of careful negotiation," and said it allows for periodic review. It added that the deal "creates the conditions for greater collaboration at the bilateral level." For China, this decision by the Vatican is belated. "The government of China has consistently maintained that external forces should not intervene in its internal affairs, including freedom of religion," Wu said in his formal statement. The foreign minister also noted his trust in the Holy See to make "appropriate arrangements" to ensure the Catholics in China are protected and "not subject to repression." While the agreement could help pave the way for formal diplomatic ties and possibly an eventual papal trip to China, it was also sure to anger Catholics who vigorously advocated for the Vatican to maintain a hard line on caring for its flock in China, where Catholic clergy and rank-and-file faithful have suffered persecution and imprisonment over the years. Wu, on the other hand, doesn't see this move has one that has diplomatic or political effect between the Vatican and China. "The Holy See has reaffirmed to Taiwan that this provisional agreement is not of a political or diplomatic nature, and will not affect the diplomatic relationship that has been in place for 76 years between Taiwan and the Holy See," the foreign minster said. Under China's Communist rule, the country's estimated 12 million Catholics — a tiny minority in the populous nation — are split between those belonging to the government-backed Chinese Catholic Patriotic Association and the underground one loyal to the pope. In Beijing, the foreign ministry put out a statement saying, "China and the Vatican will continue to maintain communications and push forward the process of improving relations between the two sides." Even as China professed the desire for better relations with the Holy See, the deal was signed against a backdrop of a Chinese crackdown on religions. Under President Xi Jinping, China's most powerful leader since Mao Zedong, faithful are seeing their freedoms shrink even as the country experiences a religious revival. Experts and activists contend that as Xi is consolidating power, he is waging the most systematic suppression of Christianity since the Chinese constitution allowed for religious freedom in 1982. Xi is trying to infuse all of the religions in China with "Chinese characteristics" such as loyalty to the Communist Party. As part of this drive, Islamic crescents and domes have been stripped from mosques and a campaign is underway to "re-educate" tens of thousands of Uighur Muslims. Tibetan children have been moved from Buddhist temples to schools and banned from religious activities during summer holidays, state-run media have reported. This spring, a five-year plan regarding Christians was introduced, along with new rules on religious affairs. Over the last few months, local governments across China have shut down hundreds of private Christian "house churches." "This is not the end of a process. It's the beginning," Burke said. "This has been about dialogue, patient listening on both sides even when people come from very different standpoints."